For Rugby fans, however, it doesn't get much better than May 30, 2009, when Wales rolls into Toronto for an international match at York Stadium. Some of them may want to see more of Canada than the inside of a stadium, and we mention here that May is one of the best months for Moose Spotting in Algonquin Provincial Park. These giants are moving out of the winter woods and gathering near the roads where they can replenish lost salts, and browse in the wetlands. If you're wondering where to go after the match, might we suggest you come for a few days to visit us in North Muskoka -- ten minutes from the park, with plenty of wildlife of our own. 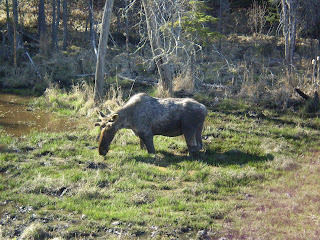 And moose-watching, well, it is definitely a gentleman's game. Played by gentlemoose. Labels: Toronto Wales Rugby Match. Rugby Union. Algonquin Provincial Park. Moose. Canadian vacations. It's been rainy up here for two days -- and don't think that hasn't knocked down the snowbanks. The thing about spring up here in Muskoka is that you can actually hear it coming. The birds arrive, and air that was home only to the calls of the winter birds suddenly blossoms with the songs of robins, killdeer, starlings and everything else coming home for the summer. The ice no longer booms and moans in the depths of the night -- now as the ice crystals separate and begin to shift the lake chimes. It's a beautiful sound (as it rips out your dock, but that's another post) And on a still night, a night without wind, you can hear a sibilance in the woods -- the sound of water beginning to flow. It's magic. The roads, on the other hand, are less magic, more pragmatic. I drove to the new J.W. Marriott Rosseau Hotel in Minnet last week for a seminar. It's quite the place. A view down the lake that goes forever and takes away your breath. It is what it is intended to be -- fabulous. Getting there, however, took me along some roads that were less than that, thanks to the same Spring I'm praising. Spring brings the frost out of the ground, and the frost doesn't like that, so it exacts revenge. Roads heave and buckle, only later to flatten back down. Potholes open. Shoulders wash away. The Aspdin Road in particular was like a carnival ride. But our roads are still light years away from the roads that confronted my grandparents. I've found two photos -both taken at almost the same location, on Fox Point Road just before the Oxtongue Craft Cabin. One shows the men opening up the road. 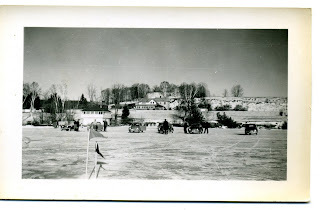 Winter plowing, with four teams of horses and men with shovels. The leading team had a 'push plow'; the other teams pulled their plows. The men sweated in between. It was a slow business, and a narrow opening at best. 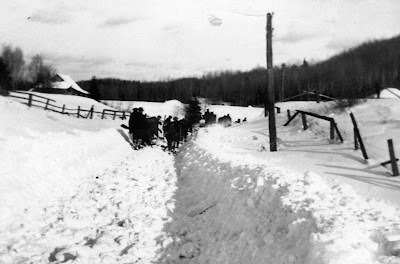 This is why so much of the travel in winter moved to the lakes in the pioneer days. 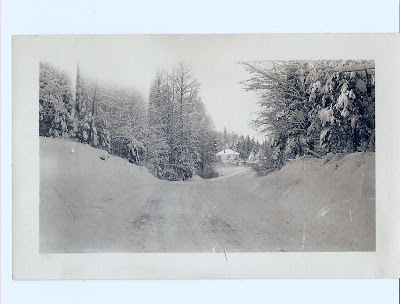 The second photo shows the road after the Township acquired it's first ever snowplow. That was a V-plow, that threw the snow equally to both sides, and opened up a one lane road only. Of course, as the winter went on and the snow got deeper, the plow couldn't throw the snow far enough off the road, and the road got narrower. And narrower. Often there was no place for two cars to pass, and you'd have to back up until you found a friendly driveway. According to my grandfather's diaries from the early 1900's, it could easily take four hours to get from Bondi Farm to Huntsville. And four hours home. Which means, really, that I have no complaints at all about our roads. And as spring progresses, they will smooth back down, becoming less of an adventure to drive. You'll still have to watch out for the deer, though. Labels: Oxtongue Craft Cabin. Red Leaves. The J.W. Marriott Rosseau Hotel. Bondi Village Resort. Township of Lake of Bays first snowplow. Nancy was in Ireland, judging at the Necarne Castle Horse Trials a year back. This was a fabulous trip, which made her feel she had segued into a Jane Austen novel ... spending the day at Necarne Castle with fine horses, fantastic countryside and outstanding Irish weather, then returning to Belle Isle Castle to dress for dinner with just the best group of people you could hope to spend time with. It was tremendous fun. As part of the trip, she was treated to a demonstration of true championship working sheepdogs. Watching them handle their flock, following subtle directions from the shepherd, was like watching a work of art. It was almost enough to convince her that what we need here at Bondi is a flock of sheep (we haven't had any here for years and years, since Bondi was truly a farm!) and a brace of well trained border collies. Watching this video has simply lent some lustre to that dream... Be sure to let your kids watch this one. These Welsh shepherds and their dogs have moved their flock of sheep into a whole new realm. Sheep have become, truly, an art form. Labels: Sheepdogs. Sheep as Art. Led Art with Sheep. Welsh shepherds. Necarne Castle. Belle Isle Castle. The public dock at South Portage, Lake of Bays, is the site of an Ontario Heritage Historical Plaque that commemorates the wonderful little Portage Flyer railway we spoke about in the last post. This project was a collaboration of the muncipal Heritage Advisory Committee, Lake of Bays Heritage Foundation, the Railway Society that runs the Portage Flyer at Muskoka Heritage Place and private donors. Like Topsy, the project 'grew'. It began as being just a plaque... but then Russ Nicholls was able to find us a donor who offered to provide a short section of the original narrow-gauge railway track. That lead to the concept of rehabilitating and beautifying the shorelines, which brought in BarkNursery -- designers of ecological gardens, and the local residents at South Portage who came out to help design, plant and tend to the garden. 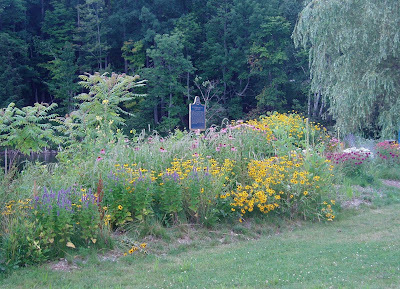 It's a beautiful spot, and was included on a tour for the Ontario Horticultural Society when they met last summer in Baysville. It's more than that, however. The South Portage dock is a curious shape. That's because it started (like our project) as one thing... but grew. It began as the Lake of Bays terminal of the railway, with a long dock projecting out into the lake where the railway could run. On either side were docking facilities for the barges and lake steamers that plied Lake of Bays. The largest of these were the S.S. Mohawk Belle, built right here on Lake of Bays, and the S.S. Iroquois. 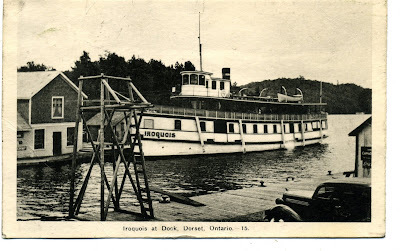 When the Iroquois - seen in this photograph at the dock in Dorset - was decommissioned, she was left tied to the South Portage dock. And she burned. What was left was, quite simply, sunk. Fill was poured into the hull of the sunken ship, and that provided the current width of the South Portage dock. If you stand on a clear day on the end of the dock, and look down into the water to the right side of the dock, you can still see the stern of the ship. You can't disturb it, though. The Marine Heritage Act carries massive fines for messing about with wrecks. You can see it, however, and get a sense of the size of this steamer. And maybe dream a bit about those days, when you'd arrive on that narrow little railway, and then climb aboard the steamer, in long dresses and gentlemen's suits, with trunks full of clothing, to spend the summer on the Lake. Labels: Steamships. Steam trains. The Portage Flyer. The S.S. Iroquois. Dorset. Lake of Bays. Ontario Heritage. Historic Plaques. Lake of Bays. Congratulations to Russ Nicholls! He recently returned from Toronto, where he got to stand in the Grand Ballroom at Queen's Park, in the company of the Hon. Lincoln Alexander and the Hon. David Onley, Lt. Governor. The occasion? The Lt. 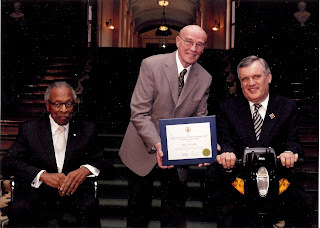 Governor's Ontario Heritage Award for Lifetime Achievement. That was the occasion. And some occasion it was! To qualify requires over 25 years of volunteer service to the preservation of Ontario's heritage. Russ certainly qualifies! He's been a heritage volunteer since the 1970's, and in 1984 he joined a committee to bring the Portage Flyer train back to the Lake of Bays. This "little engine that could" is now a working display at Muskoka Heritage Place in Huntsville. 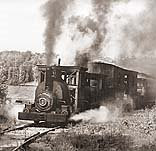 The shortest commercial railway in the world, at just a mile of track between North Portage on Peninsula Lake and South Portage on Lake of Bays, the Portage Flyer opened for business in 1904. You can read all about it in Russ' book, published in 2005, The Rebirth of the Portage Flyer. Grandmother Elizabeth Tapley, who arrived at Bondi in 1905, remembered her first ride on this little train. 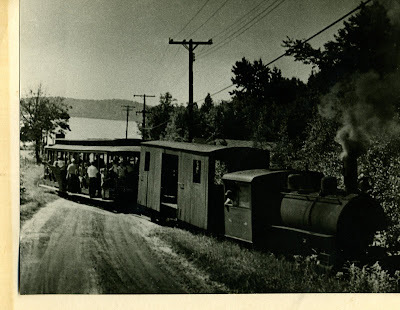 "We had to get the train down by Boyd's -- the boat stopped at every little bay all the way up to the Portage. Then, you came across on the little tiny railway -- sat on a thing like a box sleigh -- and we had to hang onto each other. It was frightening coming around the corner!" Labels: Russ Nicholls. The Portage Flyer train. Huntsville. Lake of Bays. Lt. Governor's Heritage Lifetime Achievement Awards. Lt. Gov. David Only. Hon. Lincoln Alexander. Wednesday, April 1st (and no, this is not a joke!!!) at the Dwight Community Kitchen in the Community Centre, you can whip up something other than dinner. Rebecca, from BarkNursery will be on hand to help you whip up Organic Skin Care from the home and garden. Expect to get messy (it's more fun that way). Bring a large bowl (you can fit your face in! ), a headband, bobby pins, etc (to keep your hair out while your face is in) a towel, and a facecloth for steaming. This is a DIY Complete Facial Treatment. It's a joint initiative with the Dwight Public Library (where you can find wonderful books on both gardening and skin care!) and it's from 7 - 9 p.m. $15. RSVP to Peggy, 635 3319 please. Oh, and bring a spoon, too... you're not the only thing there being 'gently simmered' -- Soup will be served, and recipes will be available. It just sounds like too much fun, doesn't it??? Labels: BarkNursery. Dwight Public Library. Spa Night. Homemade Spa products. Organic Skin Care. How to spend your Summer Vacation! David Fowler, one of our long time guests sent us this -- written by his son Paul for an assignment in Language Arts. As Dave described it to us, one suggestion was to write a description of a place to spend a holiday. Paul picked Bondi, and Dave thought we might enjoy the final result. Oh, my goodness, he could not have been more right! Thanks for sending this to us, and thanks to Paul for what he wrote!!! finish a soccer game and begin planning the evening hide-and-seek game. All this and more, can be experienced at Bondi Village Resort on Lake of Bays in Muskoka. hiking trails in the woods, where you can pick raspberries along your walk. You can expect to see deer and other animals along your nature walk. There are always canoes and paddleboats available for you after your swim in the lake. A sandpile sits on the shore where the weekly sand castle building contest takes place. Near the sandpile is a playhouse for the younger children. Children of all ages can be seen running around, playing games, and having a good time. Pick out your favourite fishing spot in the bay, or just drop your line into the water off the boat dock. the water and have a great time swimming. If you're a strong swimmer, you can swim the entire mile. Even at Bondi it rains once in a while, but you can meet your friends at the barn to play one of the variety of board games available. Maybe you could take a five-minute drive to Henrietta's bakery and buy one of her cheese buns, cherry Danishes or other amazing treats. Parents love Bondi's spacious grounds and safe environment. Their kids make new friends and learn how to get along with others. Bondi is a family-run resort, and the Tapley family will be kind and willing to help make your vacation unforgettable. Your cottage will be comfortable, clean, well-equipped, and free of TV! "Seeing all my guests having so much fun is what Bondi is all about," says Brian Tapley, resort owner. Nancy Tapley will be happy to teach you about stars and watch the Northern Lights with you after sunset. Book your vacation soon because many satisfied families return every year. Some have been coming for over 30 years and a few who came as children now watch their grandchildren play at Bondi. Labels: Writing Assignment. Summer Vacation plans. Muskoka. Bondi village Resort. Okay, folks, time to shut 'er down. This year, Earth Hour has been transformed into the world’s first global election between Earth and global warming. For the first time in history, people of all ages, nationalities, race and background have the opportunity to use their light switch as their vote – Switching off your lights is a vote for Earth, or leaving them on is a vote for global warming. Polar Bears (and people) will thank you if you Do NOT vote for that second option. World Wildlife Fund is urging the world to VOTE EARTH and reach the target of 1 billion votes, which will be presented to world leaders at the Global Climate Change Conference in Copenhagen 2009. Earth Hour began in Sydney in 2007, when 2.2 million homes and businesses switched off their lights for one hour. In 2008, the message had grown into a global sustainability movement, with 50 million people switching off their lights. Global landmarks such as the Golden Gate Bridge in San Francisco, Rome’s Colosseum, the Sydney Opera House and the Coca Cola billboard in Times Square all stood in darkness. In 2009, Earth Hour is being taken to the next level, with the goal of 1 billion people switching off their lights as part of a global vote. Unlike any election in history, it is not about what country you’re from, but instead, what planet you’re from. VOTE EARTH is a global call to action for every individual, every business, and every community. A call to stand up and take control over the future of our planet. 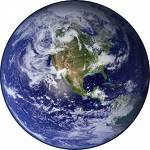 Over 74 countries and territories have pledged their support to VOTE EARTH during Earth Hour 2009, including the Town of Huntsville, and this number is growing everyday. We all have a vote and every single vote counts. Together we can take control of the future of our planet for future generations. VOTE EARTH by simply switching off your lights for one hour and join the world for Earth Hour. For more information on participating in Earth Hour, visit www.earthhour.org. If ever there was a time to 'hide your light under a bushel', this is it. If you surf back to the posts "Ice Road Truckers, Almost" or "Spinning Wheels", you'll see pictures of Brian out on the lake in front of Bondi Village in his truck. 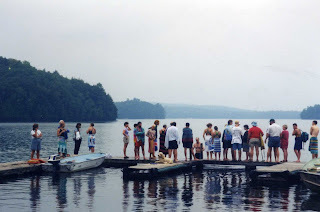 In those posts, I referred to an activity that used to take place on the Lake of Bays back in the 1950's. 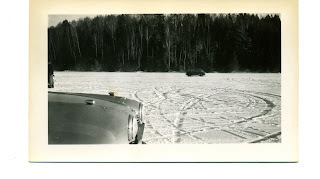 It was a Car Rally, called Dice on Ice, and it involved racing around Islands and other natural obstacles. Everyone would then park, and gather together for refreshments and camaraderie. I found these photos in our Tapley Archives -- taken in the 1950's, showing Bondi in the background, and the latest models in automobiles out on the bay. Not to mention Rosemary Tapley, with Mandy the cat. Evidently a forerunner for Achmed, the current cat with a penchant for going for car rides, Mandy was driving about on the lake with all the racers. 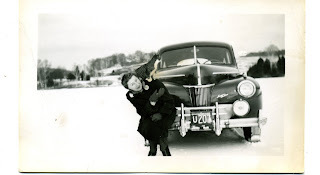 There is no notation on the photographs about how well the cat did behind the wheel, sadly. I remember my parents telling us that once, when the Rally was over, everyone parked and came to the farmhouse for warm drinks. Someone looked out the window and noticed that the cars -- all carefully parked close together in the middle of the bay -- were causing the ice to dip down under their collective weight. There was a small moment of panic while everyone raced to 'start their engines' and spread the cars out over a much wider area. This post won't be pretty. As some of you know, I am the Councillor for Franklin Ward, Township of Lake of Bays. It's Budget time... and it's ugly. Tomorrow is a Finance and Corporate Services meeting, with our third look at the 2009 Budget. The Requested Budget for 2009 currently sits at 8.59%. That's an additional $12.98 on every $100,000 of assessment. I think that is unacceptably high. From what I'm hearing over the phone, so do many Lake of Bays residents. So if you folks are reading this, and you have opinions on your tax dollars in the Lake of Bays, you might want to pencil in the Public Meeting, April 4, at the Township Office, and come to express your feelings. Labels: Lake of Bays Association. Budget 2009. This post is for those of you (oh beloved readers) who for whatever reason did NOT have the chance to watch Rick Mercer, from CBC's The Mercer Report, tramp about in the snow in Algonquin recently. He was helping the naturalists tag and radio collar black bears -- a task best performed this time of year, when the bears are in their winter quarters. And he got to "play" with the six week old cubs. That alone means he is officially on our "We're So Jealous!" list. 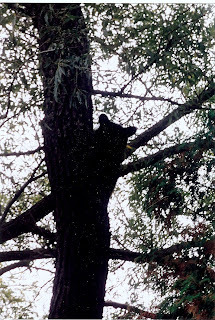 The photo of the much older bear cub in silhouette up a tree in front of Nancy's house is as close as we ever get to bear cubs. To be able to pick one up, and cuddle his six week old little self, well, the only time you get to do this sort of thing is with the scientific team collecting data. Bears in the wild are just that, wild, and dangerous to approach. Nor do we want them to get used to being around people. Labels: Rick Mercer Report. Tagging Bear cubs. Algonquin Provincial Park. Lake of Bays. Bondi Village Resort. Black Bear. How do we know it's the first official day of spring? and re-emerged at the wheel of our golf cart. The trusty vehicle we use for Housekeeping and other chores around the resort. That means summer is just around the corner. Have you booked your summer vacation yet? We still have vacancies scattered through July and August. Labels: Summer Vacations. Muskoka. Bondi Village Resort. Brent, Rowan and Jordan beat the first day of Spring to the punch, taking the plunge off the main dock into the open water of the ice-away. True Polar Bears, they plunged in, with a bit of shouting, splashed about, and came out to bundle up in warm clothes and towels. This is the view up to our Lookout. It's a great hike -- about half an hour up, 20 minutes down. Assuming you come down the trail. If you follow Brent's gang, you'll come scrambling down the mountain's face, making your own trail. Exploring. The view from the top is splendid. On a clear day, if you know where to look, you can spot the Dorset Fire Tower. And see all of Bondi Village spread out below. And, after a short break to get organized for the scramble down, you can find all sorts of interesting things. Ice, like frozen waterfalls over rock. Interesting lichens. The narrow trails left by deer. And you might -- as these guests did -- find yourself face to face with a porcupine. He was nestled in a small cave under the rocks. 30,000 quills (give or take a few) and a fairly unperturbed outlook on life means that the porcupine is pretty laid back. Our guests stared at him. He stared back at them. And they kept climbing down the hill. Labels: Bondi Village. Lookout Trail. Dorset Fire Tower. 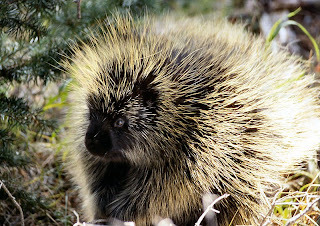 Porcupine. Warm afternoons and cold nights produced some great skating sessions on the bay during March break. For Bill, Sheri, Ali and Zack, it began with hockey sticks and shinny, but somewhere along the line they upped the ante, and showed some pretty darn classy moves! Three nights ago, our guests in the big 6 bedroom LODGE hiked out to the Island after dinner, sat on the rocks, and stargazed. Two nights ago, they met Nancy on the lawn, and she helped them identify some of these beautiful winter constellations. 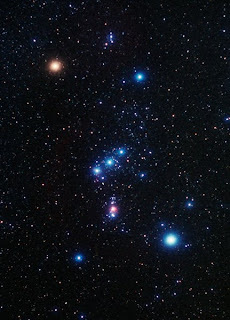 Orion is dominant just now, and easy to spot. Using the stars in Orion's belt, it is easy to find the Pleiades, Aldebaran and (heading to the left) Sirius (named, of course, for the character in Harry Potter... or vice versa) March nights are great for star watchers, because it's not that cold, and the stars up here are so bright you can almost reach out to grab one. Last night, everyone was on the lawn again, to watch the International Space Station zip overhead. Jake was the first to spot it, and everyone was amazed at both how bright, and how fast, it is. Moving at over 27,000 kph, it does scoot right along. If you missed this, you can check the Nasa website That will give you all the information you'll need to know when the Station will be overflying your area. Just one thing -- pay attention: if the site says the station will be visible between 8.08 and 8.12... they mean exactly that. Labels: Orion. International Space Station. Star Gazing. Carol has been pouring through the Seed Catalogues already. In the basement, under the lights, she's already got her first crop of lettuce out of the soil. And the bougainvillea in the sunroom has burst into colour. That, combined with the return of starlings three days ago, and the killdeer swooping in today, pretty much seals the issue. Spring is almost upon us! Ice is a powerful force. Every winter, the ice shoves on the docks, pressing against the shorelines. The shorelines are alright -- being granite, and immoveable, they go nowhere. Not so the docks. Ice pushes the docks against the shore, and causes them to buckle and warp. After a little contemplation of the problem, Brian set about fixing the dock at CLOVER cottage, taking advantage of the spring sun and the good ice conditions. And Holly, the Wonder Poodle, who firmly believes that nothing worthwhile has ever been accomplished without the assistance and supervision of a dog, was happy to settle in to the job. She did, however, decide to move when he began to drive the spikes in -- the vibration was a little more than she'd bargained for! Labels: Lake of Bays. Bondi Village. Ice Damage. Torbec Kennels standard poodles. Spring snow is fun for skiers. Hidden Valley Highlands was busy all through the March Break with Ski School, skiers and boarders. Several of our guests took advantage of this while they were here. 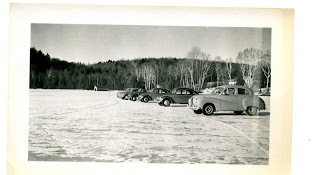 For some others, however, they were content with very minor hills... Making their first steps on cross country skiis. Jacob found that the snowbank behind the old barn provided the perfect amount of slope to help him find his balance and also work on his climbing skills. Brian's collection of hubcaps provided a most excellent backdrop to his exploits! Emmy relied on Dad to keep her upright as she worked her way along the slight slope in front of her cottage. It doesn't take long to figure out the balance, and we've certainly got no shortage of places to work on your technique! Some of the guests dispensed with the trails, and took advantage of the corn snow conditions in the back fields to simply make their own way -- that field has plenty of slopes throughout that keep it fun, while reducing the need to be able to steer! Labels: Cross country ski trails. Hidden Valley Highlands. Four years ago, Abby was just a tiny foal, frolicking in the field with her dam and the darling of all the kids at the resort. Now she's the biggest horse in the stable, and shows little sign of stopping that growth spurt anytime soon! Chris Waefler was over on the weekend, and hopped onto Abby -- the excuse was to see how she was doing with her lessons, but we think it was because Chris just put up an arena at his own place this winter, and wanted to compare! 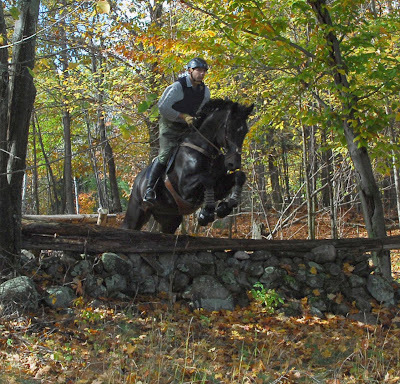 It's the first time he's been in our indoor arena -- usually when Chris is here, he's attached to his gorgeous black stallion, Killian, and we're frolicking about on the cross country course. Chris and Killian "modelled" for one of the articles Nancy -- a level 3 Equine Canada 'elite' coach -- wrote last year for Horse Sport magazine. He brings his students over here to make use of her cross country course, and she goes over there to do clinics, and he helps her with young Abby. It works well. Chris' family has a beautiful farm -- W-Ranch -- near Nobel, right on the Bay, with great vistas onto the water, and huge sweeping fields. In addition to training horses in dressage and jumping, the Waefler family breed outstanding horses. 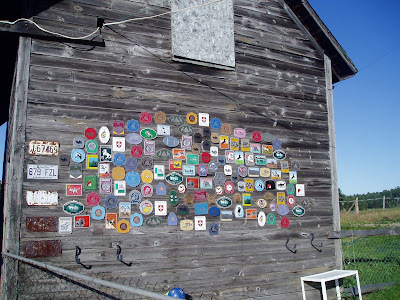 And if you're over there, check out the wall of the shed -- all those plaques that you see up there? Well, you get those by competing in international competitions in Europe. Chris' father, Peter, brought a lot of them over with him, for his prowess in driving competitions. The rest would belong to Chris himself, for jumping and dressage. Keep an eye out for their produce, too, at Farmer's Markets near Parry Sound. You won't find better homemade bread anywhere!!! Labels: W-Ranch. Level 3 Equine Canada coach. Cross country courses. Eventing. Horse Trials. But, sadly, we are not fly fishermen... and Brian has a fly rod that he would like to see go to a good home: a home that will take it out of its lovely case, assemble it, and let it taste the whip of air, the silk of water, the thunder of a trout rising to the fly. Complete with original Aluminum (green finish) and brass (very shiny) storage tube. So if you know anyone who's passion is fly fishing, please let them know. Labels: R.L. Winston Rod Company. 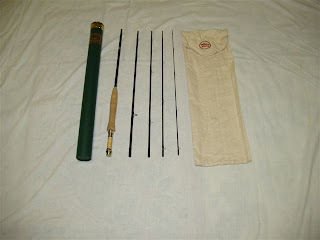 Fly Fishing Rod for Sale. This is my first shot at uploading a video to this Blog... so bear with me. And don't try to tap into this if you don't have HiSpeed, or you'll have enough time to read the Entire Blog while waiting for the download. Alex was kind enough to share this photo with us, taken when they were here two weekends ago. It's a beautiful study of a blue jay. We have an enormous flock -- probably nearly 40 birds -- hanging about this winter. 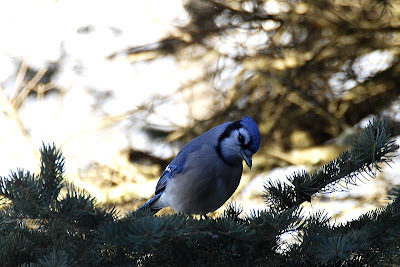 When they descend on the bird feeders, it's just a blue blurr. So, do jays stay with us all year round? Well, now, that is a mystery. Blue jays migrate. That is to say, some migrate... Some jays are present throughout the winter in all parts of their range. Some individual jays may migrate south in one year, stay north the next winter, and then migrate south again the next year. Why do they migrate when they do? We're glad some of them elect to stay, and brighten up our winter colours with their brilliant blue. But here's another blue jay conundrum: their feathers aren't actually blue. That is, the colour is not due to pigmentation in the feather, but rather to the way the feather refracts the light. That's why a jay feather won't fade in the sunlight. If you look a jay feather from the underside, it will be gray, even with light shining through it. Wonderful creatures, these noisy, boisterous jays crowding about the feeders and shovelling in the sunflower seeds. All the more wonderful when you take that closer look. Labels: blue jay. Blue jay feathers. It's good to have friends. Holly -- the Wonder Poodle, now 16 1/2 years old -- sure knows how to pick hers. In glorious March sunshine last weekend, she tagged along with Sarah, Zach and Isabel (along with Mom and Dad!) for a hike on the lake. They hiked out to the Island and back -- that's 1.6 km. in each direction! Everyone had a great explore out along the ice. The kids were wonderful about keeping to a pace Holly could match, and there was no shortage of hugs whenever requested. She was returned safe and sound, and slept even more soundly that evening! Labels: Torbec kennel. Lake of Bays. March Break activities. 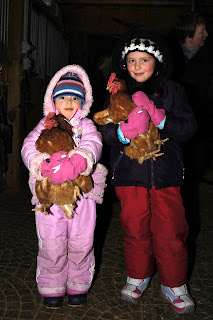 Masha and Lisa had a great time with the Chickens (all called Bob) when they were visiting us this month. People comment on how friendly the chickens are -- how could they be anything else, when they have such an enthusiastic Fan Club! Thanks to Alex, for sending on this wonderful picture of all the girls! Sunday, after Brian had very cautiously checked the ice with the ice auger in numerous locations and determined that there were 19 inches of solid ice, he and Mark ventured out onto the lake with vehicles. Now, down at Lake Simcoe, when the ice huts are out, it often resembles a parking lot out there on the lake, and if you're watching Ice Road Truckers on TV, you'll have seen truly big rigs crossing the frozen surfaces, but let us hasten to point out that it IS a venture with some risks, and the first and inviolable rule is CHECK THE ICE FIRST. The second rule, also inviolable, is CHECK THE ICE AGAIN. But, having done that, Brian went back to his roots -- back in the late 1950's, when he was merely a tadpole, Bondi used to host a funky little event called DICE ON ICE. Car races, around the island, in essence. We were just one of several locations where this afernoon's sport took place. I remember my Mom telling us about one of the events, when everyone was finished, and they lined the cars up in the middle of the bay and came up to the house for lunch. Looking out the window, someone noticed that the ice was dipping beneath the collective weight of the parked cars, and everyone abandoned their sandwiches to rush back and move the cars farther apart. This is stuff that gives insurance companies nightmares, I'm sure, but at the time it was deemed great good fun. Brian did his best to emulate those Dice on Ice participants, complete with spinning the truck at intervals... and Mark, he simply cruised around near the Island, checking out the quality of the reception he was getting on his radio -- which was naturally tuned to his own station, WMRK. Labels: ICE ROAD. Trucks on lake. Dice on Ice. They did well. Guess what's for dinner!? But this reminds us of another fishing trip for the boys, about two years ago, here in our bay. They had set their lines about 100' apart -- John had already pulled out a big trout, and it was lying on the ice. Lunch had been unwrapped, coffee was poured, and the men were sitting half-way between the two lines enjoying the spring sun. Unexpectedly, something dropped down from the air, wings wide. Vic and John stared at each other, simultaneously saying "That was a Bald Eagle!" These spectacular birds are quite rare here, and that was about the first winter that we were starting to see them around the Lake of Bays. The rangers in Algonquin tell me that last summer they identified four nests in the Park, so the birds are starting to be seen more often, but on that day, on the lake, this bird was the last thing the fishermen expected to see. There was a moment of silence, as they watched the bird leave, and then the sad truth of the moment struck home. I can't repeat the language here, but it was to the following effect: "That bird just stole our trout!" 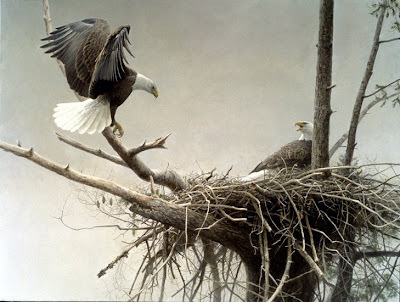 I've borrowed a Robert Bateman image of the eagle for this post, partly because I like it, and partly because I met Mr. Bateman once, when I was riding one of my horses and he was painting one of his pictures. He didn't know who I was -- which is a good thing, because I didn't recognize him either, and I suggested, upon seeing the canvas he was working on, that his work was really very good, and had he ever considered selling it? Sort of like an eagle, with a trout in its talons. Labels: ice fishing. lake of bays. Robert Bateman. Bald Eagle. Algonquin Park. Kids and Water. Kids and the Great Outdoors. It's unbeatable. Zack and Ali had a blast exploring along the shoreline, stomping on the ice, tossing icebergs off the dock (under Holly's watchful eyes) and getting down and dirty in the sand pile. We had to break out the beach toys for them! Ali found ice by the dock that was so thick, and yet so clear, you could see right through it. She also found ice crystals in various decorative formations. The kids learned about the noise the ice makes as it turns into crystals, how it sounds like wind chimes as it starts to move. They dammed up some of the rivulets, and watched how the water figured out a new way around. And they got right down to the engineering in the sandpile, having begged Mom to let them shed their snowboots. 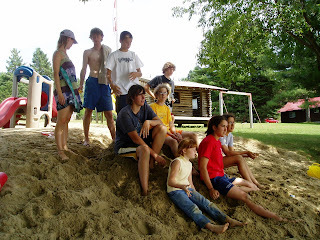 On our southwest facing beach, it was hot in the sand, cold on the ice, and too much fun to choose between. First One In the Lake! It began with Bill roaming along the shoreline in his shorts. That's how wonderful the day was. Definitely shirt sleeve weather... a veritable Beach Day. Sheri made the comment that this sun would give her a head start on her tan before going south later this spring on an incentive trip Bill won from his company. But March truly can be the silly season, and despite the fact that the swimming area was limited in size, Bill moved off the beach, and into the water -- he gets the prize for being the first one (intentionally) into the lake this year! Nor did he just jump in and out -- in true Polar Bear fashion, he hung about in the water, made a bit of a splash, and then pulled up a dock for a seat in the sun while the kids played along the shore. Cold? Well, consider that the loggers on the old log drives used to work all day in water over their knees, wearing leather boots and mackinaw pants. That's not so bad as you might think. It's when the water gets around the torso of the body that things go downhill fast. All the same, we're quite glad that we're not compelled to be in the lake when we have to share it with the icebergs! Labels: cold water. log drives. Who Says Winter is White?